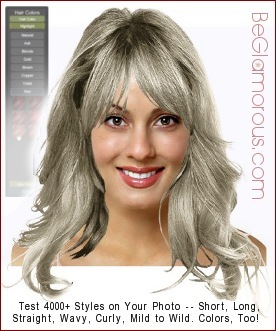 Try 4000+ gray hairstyles on your own uploaded photo, with the Virtual Hairstyle Selector. There's all types of looks for both women and men -- short, medium or long lengths, in straight, wavy or curly textures. Choose from casual, formal, updos, and the unexpected. Many people are proud of their gray -- but for those who are thinking of using dye to remove the gray, any hairstyle in the catalog can be previewed in dozens of colors (including shades of gray). You can even change highlight colors to simulate dye or lighting conditions. "AutoColor" (see below) makes it a cinch. See all features Create your look. Automatic Hair Color feature: You can also use the hair color chart to pre-set "gray" or other hair colors on any hairstyle you select. Every design in the catalog can be viewed in any color from the 50-color palette -- from ruby red to golden blonde to black to auburn. Mouse over any gallery thumbnail to see the original photo plus information. The palette lets you easily switch back to original colors. AutoColor updates the hair color not only on the chosen design, but also throughout the entire selection gallery of styles. "How to?" Q&A Homepage It's free! What types of hairstyles are you looking for? From very short to very long, the Selector offers an enormous variety of looks, such as bobs, asymmetrical crops, close-crop tresses, pixies, sassy looks, soft flows, spikes, semi-spiky, feathered, layered, wedding & bridal, looks for fine hair, retro-vintage classics of the 1920s-1990s, tomboy, chin-skimming looks, textured, styles for height at the crown, big-volume shapes, shags, blunt-cuts, side-swept fringe haircuts, geometric cuts, trendy, and more! You'll find hairstyles for any facial shape -- round, oval, oblong, square, heart, diamond, rectangular or triangular -- plus styles for any forehead type, such as wide, high or narrow. There are designs for every age, from teenage to adult, including hairstyles for women over 50 (or 30, 40, 55, 60, 70...), plus bangs of all types -- brushed forward, front, side (aka side-sweeping, side-swept or sideswept), heavy, blunt, straight-across, ayered, curved, chopped/choppy, parted, asymmetrical, angled, side-swoop, long, short, curled, eye-grazing, wispy, tapered, eyelash-sweeping, and feathered! Get started now. If you need help choosing styles & colors, there's even a wizard mode (click the "consultations" tab; more details on homepage here). You can even specify conditions such as fine or thin hair. When you've finished your look, you can save, print or share the final result (send to friends or family, or show ideas to your hairdresser). If you need help or have questions, just click the "Help" button -- or, customer service is ready to assist! Have fun, upload your picture and try hairstyles on yourself with the online Virtual Hairstyle Selector! The online Hairstyle Selector app lets you see yourself with gray hair hairstyles and compare shades of gray, offering women's and men's perms of all types, textures and lengths, and for all occasions - plus 50 hair colors and over 30 highlight hues. The Hair Color Chart (or Hair Color Palette) is accessed in the left control panel. On the internet, it is frequently asked, "should I keep my hair gray or dye it?" or "what's the best hair color for me / my skin tone / complexion / eye color?" The Hairstyle Selector website makes choosing a color easy and fun - and opens up countless possibilities with the picture you upload. However you spell it - "gray" or "grey" hair (or even "coiffures gris," "grau Frisuren," or "peinados gris") the possibilities with this online software program are amazing (you can do basic editing on your uploaded photo to prepare it for usage. This online app not only see how you would look with gray hair, but this interactive hair coloring table includes many hues, known by names such as: Gray/Grey, Brown (Mocha, Hazelnut, Caramel, Mahogany, Cinnamon, Bronze, Chestnut, etc. 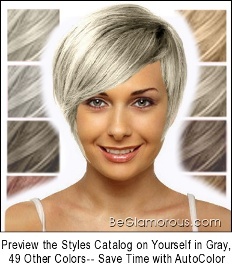 ), Blond/Blonde (Platinum, Sandy, etc. ), Gold/Golden, Violet/Purple, Red/Reddish (Ginger, Ruby, Burgundy, Mahogany, etc. ), Ash, Autumn, Black/Brunette, Auburn, Copper -- in tones ranging from Light to Medium to Dark. The site does not offer services such as free games or downloads) - and the wizard mode's quick quiz helps you find the color and hairstyle that suits you best; most styles include tutorial tips for diy home hairstyling. If you wonder "should I dye my hair to cover the grey," or just how to change hair color online, the virtual hair color chart (or gallery, picker, visualizer, selector tool, chooser, planner) lets you try shade & style ideas you like, stay in tune with trends for winter, spring, summer and fall/autumn, and see yourself with different hair color, online, with looks for all ages, including "middle age" or "older" adults. Whether you're a teen or a senior, with this gray hair simulator tool & comparison app, it's a cinch to upload a picture of your own face and try hairstyles for gray hair -- or any color you like.